Twitter-forced password changes; possible phishing attacks. 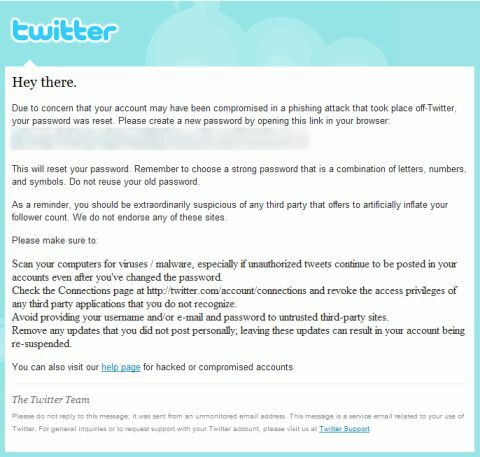 Due to concern that your account may have been compromised in a phishing attack that took place off-Twitter, your password was reset. Change your password. Make sure to use a good mix of letter and numbers. Review and rethink any third-party services you’ve allowed in your Twitter Connections setting. Very few, if any, tweets. Ever. Following thousands but followed by few. The same kinds of tweets sent out over and over and over. We will report on this issue again as we find out more details. For more tips on staying secure on Twitter, check out our blog post “Six Secrets of a Safe Twitter Account.“. UPDATE: Twitter addresses the password resets with their status update entitled Reason #4132 for Changing Your Password.